I was recently pleasantly surprised to encounter an old friend: The colorful cover of the first edition of my first book The 12th Planet (1976), reproduced in the April 2000 issue of Sky & Telescope. The photo was provided by the astronomer E.C. Krupp for his article "Lost Worlds" about misconceived predictions of planetary dooms (such as that regarding 5/5/2000). 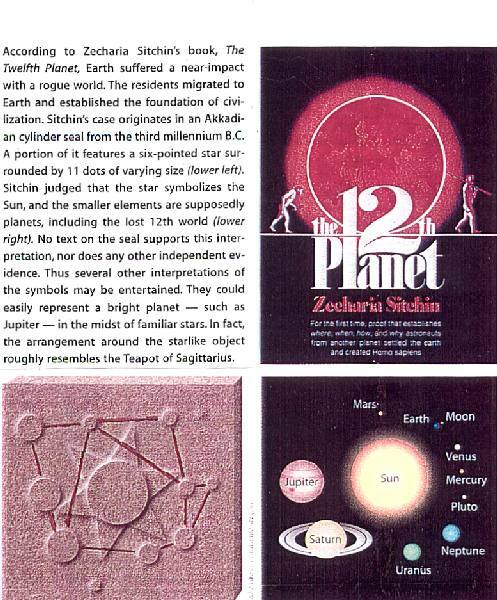 Almost a full page is then devoted to "a different astronomical misconception" -- "Zecharia Sitchin's books about ancient space colonists from a lost "12th planet" that once violently invaded our solar system." Conceding (or lamenting?) 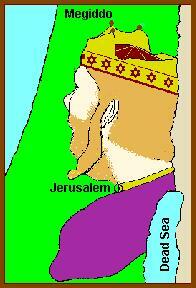 that credulous readers are persuaded by Sitchin that the traditions of ancient Sumer validate this unorthodox reconstruction of solar system history," the article suggests in a sidebar (see reproduction) that "Sitchin's case originates in an Akkadian cylinder seal from the third millennium B.C. ; a portion of it features a six-pointed star surrounded by eleven dots of varying size; Sitchin judged that the star symbolizes the Sun and the smaller elements are supposedly planets, including the lost 12th world." 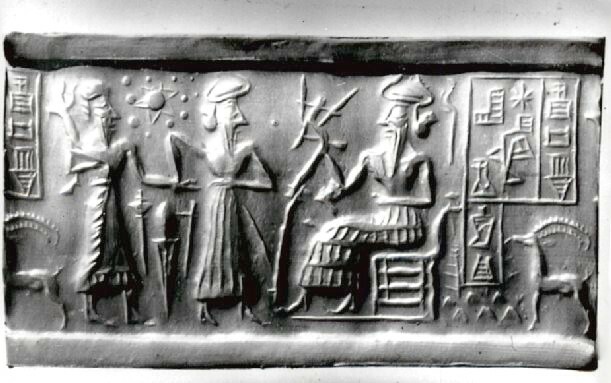 The depiction and my interpretation thereof have embarrassed astronomers for the past quarter of a century, because it is just not possible for ancient peoples to have known about post-Saturn planets, to say nothing about one more yet to be acknowledged "unknown planet." My explanation that the knowledge was provided by the Anunnaki ("Those who from Heaven to Earth came) -- Extraterrestrial visitors to Earth -- is an even greater anathema to the scientific establishment. What then to do about cylinder seal VA/243? 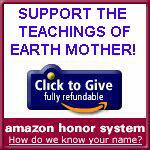 It exists, it is authentic, it is at least 4,500 years old, If not Sitchin's interpretation -- what? The 12th Planet and the magazine's two illustrations. The solution to the embarrassing enigma of ancient knowledge, as stated in the article's sidebar, is this: The depiction "could easily represent a bright planet -- such as Jupiter -- in the midst of familiar stars; in fact, the arrangement around the star like object roughly resembles the Teapot of Sagittarius." 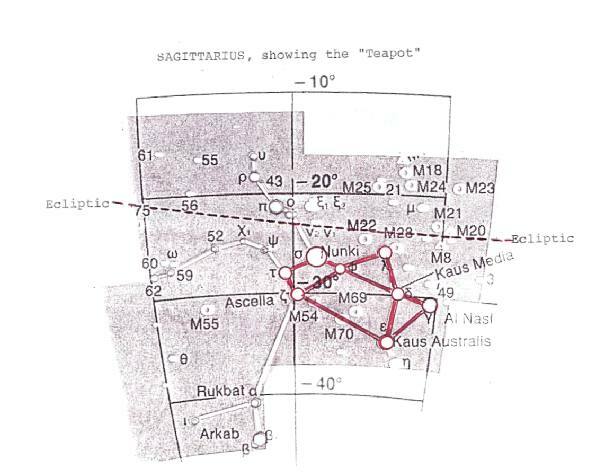 And so, if the central object is not the Sun but Jupiter (with which the ancients were familiar) and the surrounding objects not planets but the stars of Sagittarius (with which the ancients were familiar)-- Sitchin's extraterrestrials and Nibiru are not needed. A "handle" shaped by the stars designated zeta (Ascella), tau, sigma (Nunki) and phi; and a "lid" indicated by Kaus Borealis (designated lambda). But one might have to be an astronomer to realize that the offered solution is not only improbable -- it is impossible: Jupiter moves about the Sun in the ecliptic (the plane of planetary orbits around the Sun); it never dips enough in the southern skies to appear in the midst (the magazine's words!) of the Teapot! The illustration of Sagittarius that shows the "teapot" also indicates the ecliptical path, in which Jupiter moves. AND THE TWAIN CAN NEVER MEET! Jupiter, once in about twelve years, does scratch the northernmost protrusion of Sagittarius; but it never comes even close (in astronomical terms) to the Teapot, and could have NEVER been observed "in the midst" of the Teapot. And so, even after a quarter of a century, "Sitchins misconception" continues to stand.